Apple's online store was taken down Thursday night as the company braced for what is expected to be a flood of preorders for its recently-announced next-generation handsets, the iPhone 6 and iPhone 6 Plus. As seen in the screenshot above, the Online Apple Store is now showing a new "We'll be back" notice indicating maintenance sometimes associated with a major product launch. 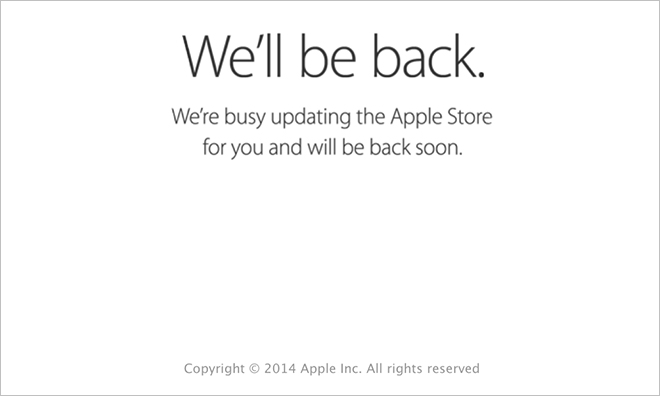 The digital storefront was pulled some three hours before an anticipated midnight start to iPhone 6 preorders. The 4.7-inch iPhone 6 and 5.5-inch iPhone 6 Plus were revealed at a special media event on on Tuesday. Both models have Retina HD displays, a new design aesthetic closer in form to the iPad mini and more powerful components like an A8 SoC, M8 motion coprocessor and upgraded cameras. Differentiating the iPhone 6 Plus from the iPhone 6 is a higher-density 401ppi display, optical image stabilization for the rear iSight camera and special landscape viewing modes in iOS 8. AppleInsider was able to take a hands-on look at the new devices and found the new form factor to be quite comfortable despite its large size. On-contract pricing for the 4.7-inch iPhone 6 starts at $199 for 16GB, then moves to $299 for the 64GB version and maxes out at $399 for 128GB of onboard storage. The iPhone 6 Plus is also available in 16GB, 64GB and 128GB capacities for $299, $399 and $499, respectively. The contract-free T-Mobile version starts at $749 for the iPhone 6 and $849 for the iPhone 6 Plus, moving up in $100 increments depending on storage. Those looking to trade in their old hardware to offset the cost of a new iPhone 6 or iPhone 6 Plus can refer to AppleInsider's Trade-In Price Guide for the latest deals. Preorder numbers are expected to be high, as it was reported earlier Thursday that Apple is allowing in-store pickup of online orders, cutting down on launch day crowds and streamlining the purchase process. It is unknown how long the in-store pickup option will last, however, as supply is also needed for walk-in customers. Apple and U.S. partner carriers Verizon, AT&T, Sprint, T-Mobile and more, are expected to start taking preorders at 12:01 a.m. Pacific. Launch countries Australia, Canada, France, Germany, Hong Kong, Japan, Puerto Rico, Singapore, and the UK are also expected to field preorder reservations. Alternatively, customers can purchase the iPhone 6 at brick-and-mortar Apple Stores on Sept. 19.